The median price in August fell to $225,000, down 1.7 percent from August 2005. That was the first time since April 1995 that the national median price was lower than the same month a year before. 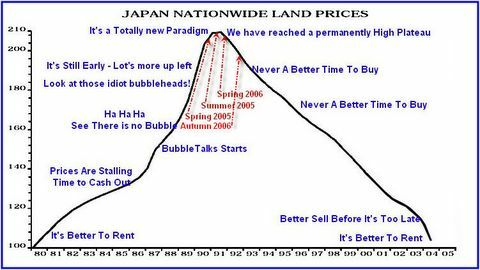 On that news I thought it was time to update my comparison of the US housing bubble with that of Japan’s in the 80’s and 90’s. The current picture looks like this. 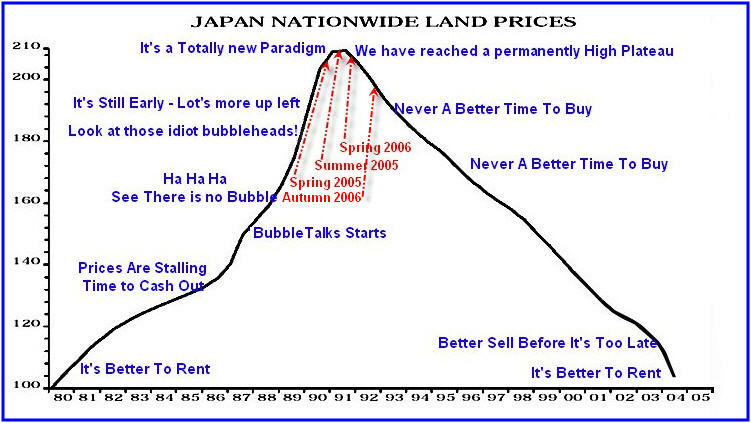 A discussion on where previous arrows were put and why can be found in US vs. Japan Land Prices Pictorial Update. I had a much harder time figuring out where to put the arrow for this pictorial update. The reason is because home prices nationally have actually been declining for some time. I have commented on this many times before, but for new readers, home builders have been reporting “full price sales” while giving hundreds of thousands of dollars in incentives, new cars, vacations, upgrades, reduced interest rates, etc and chalking those expenses up as “advertising costs”. Mammoth price reductions from every national builder have been going on since the beginning of the year. Here is a typical example from Horton. The above ad came out on September 23 for the Daytona Beach / Palm Coast Area. Price on the Grand Teton model was $282,445 and is now $197,445. That is a 30% haircut. Not only is that a 30% haircut but it is important that the entire subdivision was just repriced 30% (plus appliances) lower. 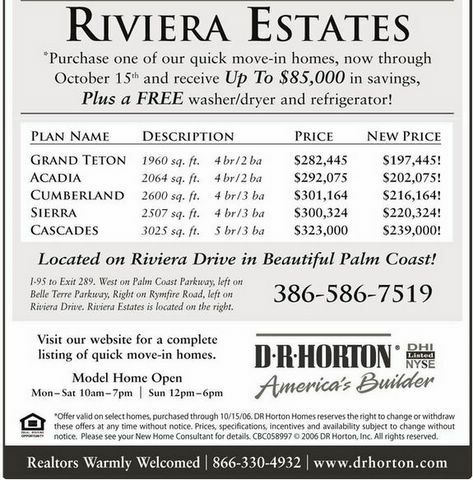 Any flipper who paid full price is now 30% underwater (not counting interest expenses, insurance, property taxes, etc. Can that flipper sell for $197,445? Of course not. A realistic price IF one could find a buyer might be $185,000. After all who wants to by a used house when a new one is about the same price, has “free appliances” and comes with a warranty? Add in real estate commissions and that flipper may be down by as much as 50% or more. Rent it out? Supply of rentals (especially on condos) is exploding. Meanwhile prices continue to drop. This kind of action has been going on for over 6 months in most of the country to varying degrees. In addition to the enormous price reductions, there is a more subtle portion of the ad that shows stress on homebuilders and prices. Right at the bottom of the ad in large type is the message “Realtors Warmly Welcomed”. A year ago builders refused to split commissions with realtors. Now builders are offering triple commissions to realtors. That is a dramatic change and right off the bottom line of builders. There is absolutely no indication of working through any housing inventory. In fact inventory is now up to 7.5 months as compared to 7.3 months a month earlier. Those numbers are from the NAR so it appears Lereah is not even following his own reports. Furthermore, builders keep on building faster than home sales are rising. Thus home building continues to add to supply. REOs (real estate owned by banks due to foreclosures) is also rising. That adds to supply. Massive rises in bankruptcies in the rust belt and Colorado is adding to supply. The demographics of boomers retiring will add to supply for years to come. There is simply no reason to expect either stable prices or inventory to be worked off in this situation. NAR chief economist David Lereah said an anticipated decline in prices compared with a year earlier has begun and is likely to continue until the end of the year, helping to support sales. “With sales stabilizing, we should go back to positive price growth early next year,” Lereah said. Lereah “anticipated a decline in prices”? When? What amazing spin from someone buying and recommending Florida condos right before the crash, and who has argued that fundamentals would never let a year over year decline happen. Yeah right. 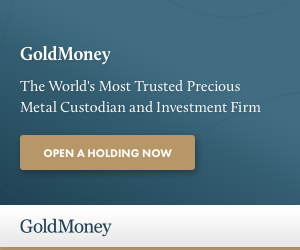 That is why Horton is offering 30% discounts and still has no buyers and various markets like Florida, Boston, Detroit, and now places in California have come to a standstill. The collapsing U.S. housing market crossed another milestone in August, as the median sales price of existing homes fell for the first time in 11 years and for just the sixth time in the past 38 years, the National Association of Realtors said Monday. Sales of existing homes fell 0.5% in August to a seasonally adjusted annual rate of 6.3 million, the industry group said. It was the lowest sales pace since January 2004. Sales have fallen five months in a row. Sales are down 12.6% in the past year. Does Lereah have an ounce of credibility left? In Northern Virginia MarketWatch – September/October 2006 McEnearney Associates posted Top Ten Reasons To Be Optimistic About Northern Virginia’s Housing Market. 10. The softening of the market. Believe it or not, that’s a good thing. There is no doubt that the market is slower and softer in every respect when compared to the last several years. The 20%-25% appreciation rates were not sustainable. And the longer they continued, the harder the fall would be. 9. The media. OK, this may seem a bit tongue-in-cheek, but area homeowners should rejoice every time the national media and even local media predict doom and gloom for area housing – because they have so often been wrong. The relentless drumbeat of negativity seems almost totally disconnected from reality. Our current favorite: Forbes predicts that the median price of a home in metro DC will increase only 3% over the next ten years. Not 3% annually, mind you. A total of 3%. In the best regional economy in the country. 8. History. The compounded average annual increase in the average sales price of a home in the metro DC area over the last 30 years is 7%. (Forbes, are you paying attention?) 7% is normal; 7% is sustainable. We won’t see that in 2006, but an individual’s housing decision should be a long-term decision. Feel good about owning a home here – unless you have to sell right now. Reason number 10 seems to suggest that home prices are going to go up because they are now going down. Obviously that is silly. Reason number 9 ignores the fact that the Media did nothing but report good news for years, topped by the Cover of Time in Summer of 2005 “Why We’re Going Gaga Over Real Estate“. As bad as sentiment has gotten, it is nowhere near the extreme we saw at the top. That cover marked the secular peak in housing. Besides, places like McEnearney Associates were bullish when sentiment was bullish and are now supposedly bullish because sentiment is bearish. More than likely we will see prices drop 30-50% over 2-4 years depending on the bubbliness of the area, then chop sideways or down (again depending on the market), for between 6-10 years. That is what it will take to average 7% a year given the unprecedented four standard deviations above the mean rise in home prices compared to both wages and rent since 2000. That may also be the best case scenario. When the attempt is so blatantly obvious to spin every piece of news positive by Lereah and others why should anyone pay attention to them? I have news for all the real estate wizards, flippers, and cheerleaders. Sustainable positive price growth is years away. We are closer to the peak (heading down) than the trough (about to head back up). Mike “Mish” Shedlock is a registered investment advisor representative for SitkaPacific Capital Management. Sitka Pacific is an asset management firm whose goal is strong performance and low volatility, regardless of market direction.